Fanatic Muslims throw stones at Christian property. 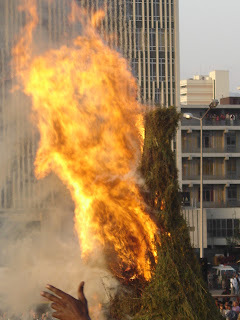 Last Friday, 28 September 2007, an Ethiopian Orthodox Tewahedo hymns advertising car was stoned by Muslims participating in Friday prayers in a mosque around Sheraton Addis. The reason and damage is yet to be confirmed. The chaos finally subsided after federal police reached in the area. As the modern man would communicate with remote areas through telephone, telegram, fax, media etc. and exchanges the necessary information each other, we understand from history that the ancient society expressed their victory, joy, and transmitted their messages by lighting 'Demera' or bundle of twigs on mountains. 'Demera' is a Ge'ez term that means adding and uniting. The word commemorate the hiding of the Cross of Christ by Jews because His Cross performed different miracles, such as: gave light to the blind, cleansed the lepers, expelled demons, gave life to the dead, etc. Hence, they agreed to bury the true cross of Jesus with two other crosses of criminals. The rabbis ordered the people to pile ashes and dirt on the site where the cross buried. Christ's Cross-was buried about 300 years. However, as our Lord Jesus said "There is nothing covered that will not be revealed, and hidden that will not be known," (Mat. 10:26), God chose Empress Helen, the mother of Constantine the great who guided by was able to find the site where the Cross was buried. She made 'Demera' (bundle of twigs) lit it and the smoke coming from the incense pointed the exact place where the cross was buried. Empress Helen ordered her servants to start digging from Meskerem 17. (E.C) Onwards. Finally, the true cross was found on Megabit 10 (March 19) 327 A.D. The Queen then rejoiced and the people expressed their happiness by lighting a bundle of twigs (Demera). That is why the feast of the finding of the true cross or Demera of Christ is celebrated colorfully and joyfully. The Torah states, "Thou shall not remove thy neighbor's landmark, which they of old time have set in thine inheritance," (Deut. 19:14). May the blessings of The Holy Cross be with us all, amen. 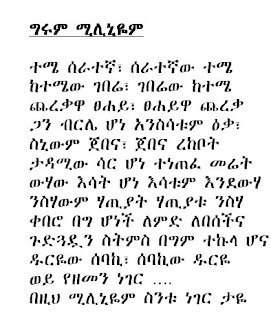 THE ABOVE ARTICLE WAS TAKEN FROM A BROCHURE Prepared by "The Ethiopian Orthodox Tewahedo Church, Evangelical and Missionary Activities Department. Addis Ababa- Ethiopia,Sept. 26, 2002"
His Grace bishop Qewstos has left for Ethiopia today Monday 24, 2007. He will participate in the upcoming holy synod meeting and he will be expected to come back to his new diocese in Washington DC. However, as experience tells us, the patriarch might not leave him to return to USA. His grace has touched many hearts with his religious and tearful teachings and holy life. Many people, especially those not closely related to the Church life have not understood him, aligning him to the patriarch in Addis. Deje Selam appreciates their concern, but it is not a tangible concern. His Grace Bishop Qewstos is an exemplary father by any standard, and who does not fear to express his ideals whenever the need arises. His recent book written about the fellow bishop martyr His Grace Abune Petros can be an exemplary evidence in this regard. We need his grace back in USA and continue his much needed ministry. For those of us who wish to have been born at the time of a Christian King (Atse Kaleb or Kidus Lalibela) who prayed at night and ruled by day. For those of us who wish to have been born at the time when St.Giorgis helped the soldiers in their battle, to be part of the excitement and say "Kidus Giorgis be Nich Ferese be mekakelachew taye".For those of us who wish to have been born at the time to say our father Abune Petros died for his people and country.For those of us who did not get the chance to feel our hearts burn with the inspiring teachings of Abune Gorgorios.This was a blessing to see a father who is gifted with tears of Love, spirit of peace and wisdom and strength. NEW YORK (AP) — Ethiopian sea traders established the Abyssinian Baptist Church nearly 200 years ago. Now 150 church members led by their politically influential pastor, the Rev. Calvin Butts, are honoring the Harlem church's founders with a two-week pilgrimage to the African nation to discover their spiritual roots. "I think we will all come back better people," one of the travelers, Doris Brunson, said. "As American blacks, we really need to understand the importance of our source. I think what we will see will be beautiful in some ways, and devastating in some ways." The trip is part of an 18-month bicentennial observation that will end in November 2008, the actual 200th anniversary of the church's origin. Butts said when the trip was announced in May that it had several purposes including "fellowship with the Ethiopians," missionary work and creating an orphanage for the children of AIDS victims. The church's connection to Ethiopia goes back to its founding in 1808 by free blacks and Ethiopian merchant seamen who refused to worship in segregated churches. Abyssinia is a historical name for Ethiopia. Today the church has 4,000 members and draws crowds of tourists every Sunday. According to Washington Post report from Europe, Converts To Islam are posing threat in Europe and in USA. They are playing an increasingly influential role in Islamic militant networks, having transformed themselves in recent years from curiosities to key players in terrorist cells in Europe, according to counterterrorism officials and analysts. The arrests this month of two German converts to Islam -- Fritz Gelowicz and Daniel Schneider -- on suspicions that they were plotting to bomb American targets are just one example of terrorism cases in Europe in which converts to Islam have figured prominently. In Copenhagen, a convert is among four defendants who went on trial this month for plotting to blow up political targets. In Sweden, a webmaster who changed his name from Ralf Wadman to Abu Usama el-Swede was arrested last year on suspicion of recruiting fighters on the Internet. In Britain, three converts -- including the son of a British politician -- are awaiting trial on charges of participating in last year's transatlantic airline plot. Religious converts are sometimes more prone to radicalization because of their zeal to prove their newfound faith, analysts said. They are also less likely to attract police scrutiny in Europe, where investigators often rely on outdated demographic profiles in terrorism cases. The trend is not limited to Europe. In Florida, U.S. citizen and convert Jose Padilla was convicted last month on conspiracy charges for participating in an al-Qaeda support cell. In March, David M. Hicks, an Australian convert, became the first prisoner at the U.S. prison at Guantanamo Bay, Cuba, to be convicted on terrorism charges. Converts have joined militant groups, including al-Qaeda, for years. Wadih el-Hage, a Lebanese Christian who converted to Islam and became a U.S. citizen, served as an aide to al-Qaeda leader Osama bin Laden in the 1990s and was convicted for his role in the 1998 U.S. embassy bombings in East Africa. The 4th Patriarch of the Eritrean Orthodox Tewahdo Church, Abune Dioskoros, gave a blessing to people in Eritrea for the New Year. Both Ethiopia and Eritrea are known to follow the Geez New Year. The international community has been condemning the Eritrean government for deposing and arresting Abune Antonios, who is widely believed to be the real Patriarch of the Eritrean Orthodox Tewahdo Church. Despite such issues, this has been a common trend in the horn of Africa since many Ethiopian governments have also been known for removing Patriarchs for political reasons. State sponsored persecution of church members have tremendously reduced in the region the last two decades. However, the Eritrean government has recently been criticized for allegedly torturing and killing Evangelical Christians in Eritrea. Accoding to Voice of the Martyrs, another Christian in Eritrea, Nigisti Haile, was allegedly tortured to death by the Eritrean authorities this week. Patriarch Dioskoros prayed for the faithful inside the country as well as for the Eritrean Defense Forces. I am not sure why I feel puzzeled to see year 2000 being celebrated in Eritrea. That means, atleast the Church is still in its good old tradition. 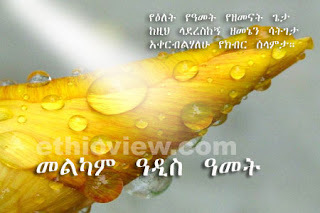 I came across the term <Geez Newyear>, to mean the Ethiopian calendar. Wow!!! 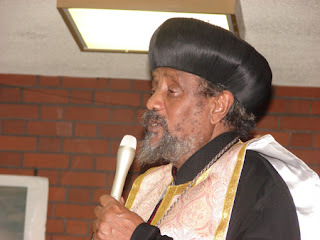 Mahibere Kidusan, the renowned association in the Ethiopian Orthodox Tewahedo Church, has launched a new web site in USA. I found it blessing, religious and spiritual. It is solely in Amharic, and I am not sure if they are planning an English version. I am content with this first step though. Their welcome message shows their plan and vision, teaching doctrines to educating Children. I am your frequent user, I appreciate what you are doing. It was about seven years back, by 2000 G.C. I wrote this poem. Now I got time to send you by the Ethiopian 2000. If is good, please post it. Melkam Addis Amet, Melkam Sostegna Shih Amet!!!! This festival celebrates both the New Year and the Feast of John the Baptist at the end of the long rains in Spring, when the Highlands become covered in wild flowers. Children dressed in new clothes dance through the villages, distributing garlands and tiny paintings. In the evening every house lights a bonfire and there is singing and dancing. Don't you miss it? I do. This year's celebration will definitely be the most unique one. We pray the new millennium will be for Ethiopia and her children, for their Renaissance, and reclaiming their good old position. There IS a BLESSING SPEACH BY HIS GRACE ABUNE QEWSTOS, ARCHBISHOP OF WASHINGTON AND ITS ENVIRONS. Please go to Washington DC program from Sept 8, 2007. One artist’s bold innovations of the 1,500-year-old artistic traditions of the Ethiopian Orthodox Church will be on display. His subjects range from vivid images of rural and urban life in Ethiopia to striking depictions of Christianity from an Ethiopian perspective, and the political and military exploits of 19th- and 20th-century Ethiopian rulers. But it is Adamu’s unconventional approach—including unusually layered, truncated and fused images and seldom-considered perspectives—that marks the work of this extraordinary painter who has transcended the confines of his artistic education.